One of the keys to achieving happy modelers syndrome is the ability to prepare mixtures of paint that behave in a predictable and reproducible manner when sprayed. Reproducibility is essential if you intend to shoot the same brand(s) of paint often and want to rely on a predictable set of characteristics every time. Variables such as the best spraying pressure, optimal working distance, and fine-line ability will be known ahead of time based, in large part, on the concentration of paint (high or low) in your mix. In my previous life as a scientist I prepared solutions on a daily basis. 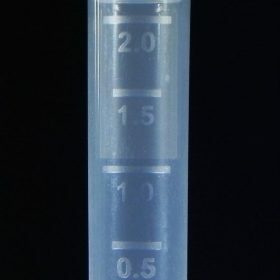 One of the tools that made that job easy were laboratory spin tubes. 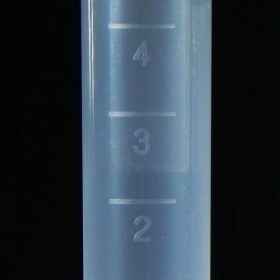 These sturdy and re-usable tubes have easy-to-read measuring gradations and are designed to hold all manner of nasty chemicals while enduring high-G centrifugation—-without leaking. 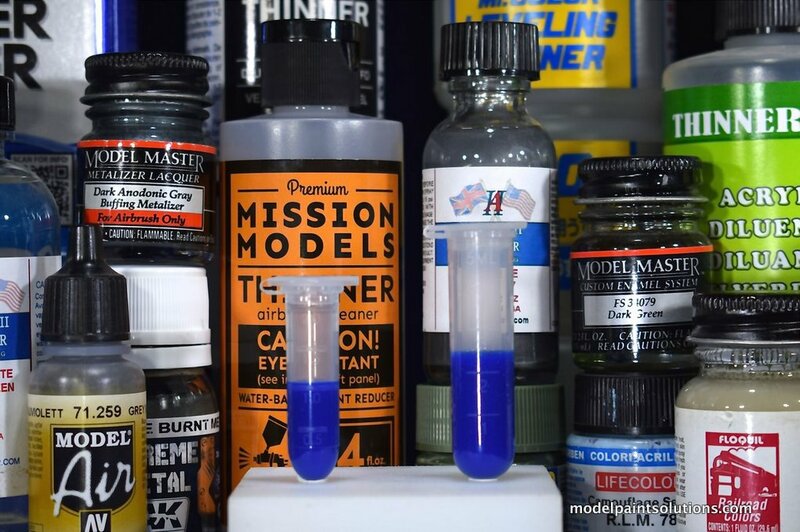 I’ve measured, mixed, and stored practically every brand of model paint using these tubes and they aren’t affected by anything including lacquer thinners, acetone, and denatured alcohol. These tough little tubes quickly “migrated” to my modeling workbench becoming an essential tool anytime I dilute a paint or clear coat for spraying. In addition, that unused paint can be put back in the spin tube and stored for future use. The seals on both the 2 and 5 ml tubes are tight enough to store even lacquers for years with no problems. Most importantly, if you use the measuring gradations and follow some simple suggestions (below) whatever volume of paint mixed will have the same exact ratio of paint to thinner every time you mix it. That’s reproducibility and the first big step to airbrushing happiness. 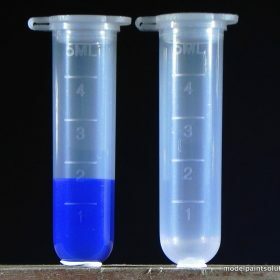 In order to reliably measure small amounts of paint using either size tube you only have to remember one easy relation. One ml equals one thousand micro-liters or “Mikes”. That’s cool-guy lab jargon but much easier than micro-liters. For general airbrushing jobs, I dilute most acrylic paints to roughly 30% or ~1/3 paint using the manufacturers thinner. A mix of ~30% paint is what I would use to shoot the blue of a Hellcat, the panzer grey of a 1/35 Tiger, or 1/48 landing gear parts. Most paints diluted to ~30% spray well at 10-15 psi with a working distance of 3-4 inches. For jobs that require better coverage (meaning denser paint and fewer passes to get an opaque coat), I might use 40% paint. The exception to that would be Mission Models which sprays beautifully at concentrations of ~50% paint. For fine-line work, I dilute Mission Models, Vallejo, Gunze, Tamiya, and LifeColor to ~10-20% paint. Such low concentrations of paint require the pressure to be lowered to ~6-10psi and the working distance (tip to model) decreased to less than 1 inch. If I’m going to be shooting on top off pre-shading, I err on the side of lean or less paint (20-25%). A thinner paint mix will require more passes for acceptable coverage however this gives you better control over the density or opacity of the coat. This lessens the chance of applying too heavy a coat and loosing subtle pre-shading underneath. In the extreme, a thick coat of paint can obliterate engraving and subtle details on the models surface. In general, my working rule is the thinner the layer of paint, the better. For additional suggestions on how to dilute and spray acrylic paints go here. For suggestions on how to match the airbrush cleaner with the acrylic paint you’re using go here. 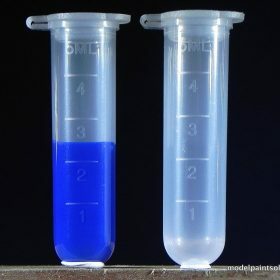 For suggestions on how to dilute and spray Mission Models Primers and Paints go here. 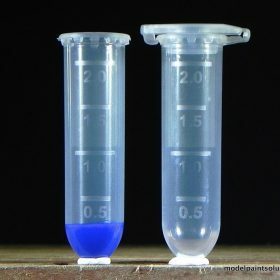 For a 5ml tube, paint is added to a point equidistant between the 1 and 2ml gradations. 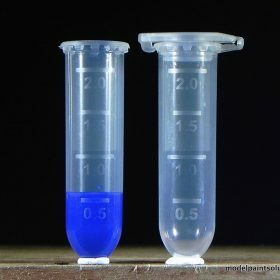 This would be ~1.5ml or ~1,500 Mikes as shown. Thinner would then be added to the 5ml (5,000 Mikes) gradation resulting in a final mixture of 30% paint. 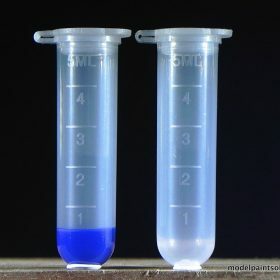 I’ve been using lab spin tubes to mix all my paint, primers, and clear coats for more than 20 years. As long as these tubes are properly sealed (with a click) they simply don’t leak. Moreover, using the tube gradations to prepare paint mixtures will permit you to make dilutions that have reliable and predictable spraying characteristics every time you mix paint. Since the caps seal so tightly, your unused mixtures can be stored for use at a later time. 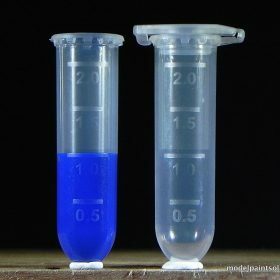 Although it may be unnerving, both sized tubes can be stored upside down on their flat lids which is what I do on my workbench. Alternatively, foldable tube racks that accommodate both the 2ml and 5ml tubes are available here.